NOTE: The table below is fully sortable please click headline (i.e. Station) to sort the table. (T) stands for a tentative log. Sometimes in the recording title, you’ll see DV or LH letters. That represents antenna/position. DV stands for (FM) Dipole in Vertical and LH stands for Cubical Quad Loop in Horizontal. Other combinations are possible. Hover over the station name to see remarks. All data is relevant to the reception date. Regarding tropospheric radio propagation April 2018 was, shall I say, better than March? This post will summarize three days of tropospheric reception from April 2018. First signs of potential tropo conditions were noted on 4th April and continue to develop for the next few days. 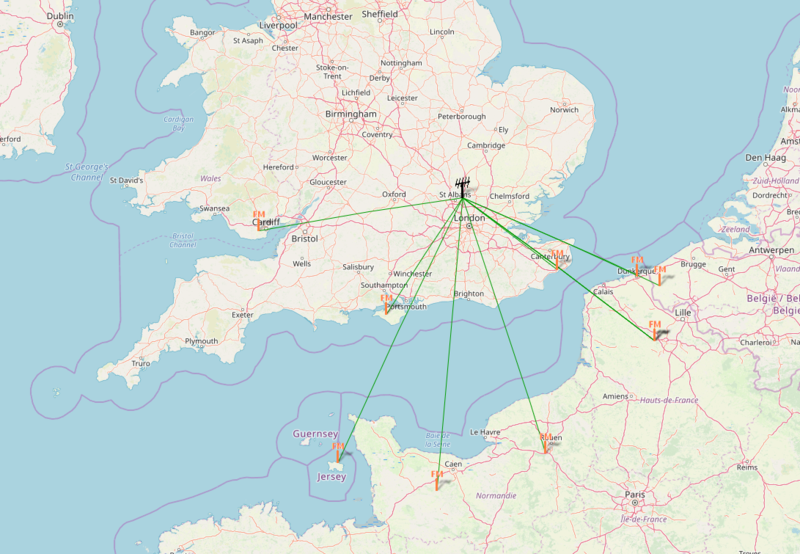 In the South of the UK, signals from Northern France appeared on the band. It appears that I only received tropo usual sites from France such as Lille, Caen and Reims-Épernay. All signals were rather weak with bouncing reflection effect. On 6th April 2018 conditions continue and spread over Belgium. Apart from regular signals from Northern France, I was also receiving enhanced signals from Egem in Belgium. Majority of these were weak and not worth to compile in a log. For the next two weeks conditions back to normal. On 18th of April 2018 prediction maps began to show a partially green colour on the South of the UK indicating a potential temperature invention. It was my working day so not enough time was given for DX. Despite an early weak up, It was rather a disappointing day but new sites were received. I see from the remarks that I was using Airspy HF+ SDR along with Kenwood car stereo for this tropo catches. 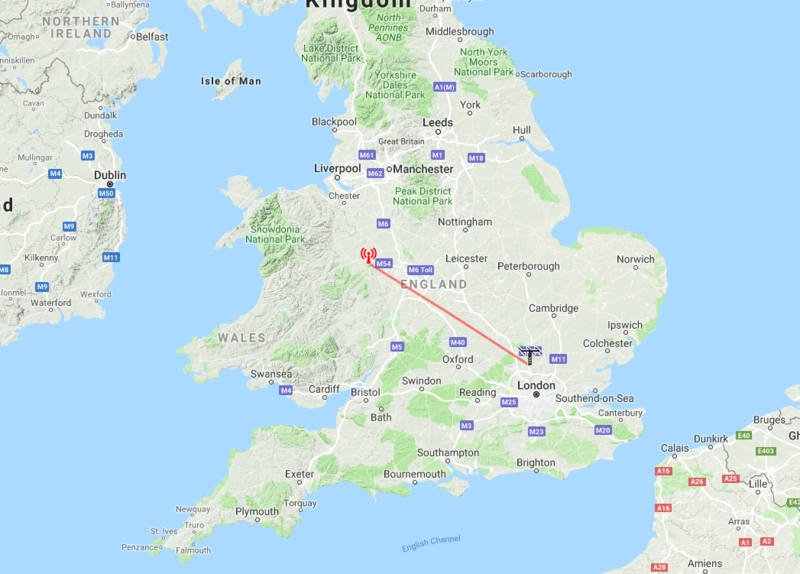 Shortly after wake up, at 0523 UTC, I heard very weak 94.8 BBC Coventry & Warwickshire from Meridan with partial ID. The station was received on a vertically polarized dipole and Aisrspy HF+. This was a new site for me. Recording of this reception is here. The distance is 122 km. TX ERP is listed as 2.20kW. At 0527 UTC 101.0 Nostalgie Vlaanderen from Oostvleteren in Belgium (this site is no longer listed) came in playing Seal. This was also received on a vertically polarized FM folded dipole. Although the signal was not strong, it was the first catch of this site. You can listen to the recording here. The distance for this reception is 225 km and the TX ERP was listed as 20.00kW. At 0720 UTC I stopped on 93.1 MHz and I was hearing BBC R4 transmission. The search for a site revealed potential candidates for this signal. The signal was received on a vertically polarized FM folded dipole. I excluded two TX sites, Blaenplwyf and Belmont. These were too far for the tropo conditions range. The remaining sie is Folkestone, which appears to be in the tropo direction. The site has a vertically polarized transmission. Signals from Lille were heard that day so it is highly possible that I was receiving 93.1 BBC R4 from Folkestone. The site ERP is listed as 100W and the distance to me is 125km. Later at night, I was receiving enhanced signals from Manningtree in Essex. Visual map log below. Good conditions continue onto the next day. Same as above, a very little time was spent on DX although new sites were received. At 0723 UTC 90.4 VRT Klara from Egem (BEL) was received on a vertically polarized dipole and an Airspy HF+ SDR. Egem site is very often here but 90.4 VRT Klara is a first-time reception. At 0735 UTC 92.4 BBC R3 from Swingate was here playing Classical music. The signal is almost clear, without major noise. At 0743 UTC unexpected 94.2 BBC R4 signal appeared on the band. Given previous catch of 92.4 BBC R3 from Swingate, I tend to believe that 94.2 BBC R4 was coming from Hastings site. I received this signal on a vertically polarized FM dipole antenna. If the signal was genuinely coming from Hastings, It’s my first DX of this site. TX ERP is listed as 500W and the distance would be 155 km. At 0809 UTC 89.6 BBC R2 was heard. The signal was weak but confronted with BBC web stream. I marked this catch as Hastings but it also could be Les Platons. Received on an FM dipole antenna in V.
At 0844 UTC weak signal of 91.2 BBC R3 was heard. Given tropo direction, I tentatively marked this reception as Blunsdon. I received it on FM folded dipole in vertical polarization. The site is listed as 200W and the distance would be 109km. This is the closest possible site. Another tentative (stronger) TX site would be in Bilsdale West Moor, North Yorkshire. The site is rated at 5.00kW. Friday, the 20th of April 2018, was my working day. I stick with afternoon shift for the entire week. Friday supposed to be the best day for tropospheric occurrence according to predictions. There was a lot of hope for strong signals that day as the forecast was showing a green colour on the map. Two previous days, with a high-pressure system and continues heat wave over Europe give you the sense that something is brewing. There’s still hope for tropo when temperatures start dropping. The whole central Europe is covered by heat from North Africa. This will, eventually, be replaced by a cooler air mass. First catch at 0813 UTC was 100.7 Radio 100,7 from Dudelange in Luxembourg. Unfortunately, this is only an air scatter and the reception was weak. There is a possibility that the duct wasn’t reaching here yet. According to the maps, the tropo lift was predicted from the West of the UK. A grim of hope for Irish signals was in my mind. Did it happen? At 0854 UTC I received strong RDS signal of 89.3 BBC R2 from Holme Moss transmitting tower. I was receiving the signal on a vertically polarized FM folded dipole. RDS reception proved that tropo lift is real. As temperatures start to recover more and more signals from West of the UK began to show on an SDR spectrum. At 0915 UTC I received 96.0 BBC Radio Shropshire from The Wrekin. This is first-time reception of this station and location. The multiplex transmitter is rated at 4.80kW and the distance is 187 km. At 1018 UTC I was receiving an extremally weak signal playing Corona – The Rhythm Of The Night song. Upon further investigation, it appears to be 97.2 Heart Wiltshire from Blunsdon. Shortly after, at 1024 UTC, very weak Classical music was heard on 100.8 MHz. It was 100.8 Classic FM from Blunsdon. 97.2 Heart Wiltshire TX ERP is rated at 0.70KW. 100.8 Classic FM ERP output is slightly stronger and rated at 0.72kW. Nevermind the weak reception, I was quite surprised that I received these two signals indoors. The distance to Blunsdon is 109 km. At 1043 UTC my time for FM DX was just about to finish when I heard an extremally weak flute music on 98.7 MHz. My adrenaline level has risen instantly! 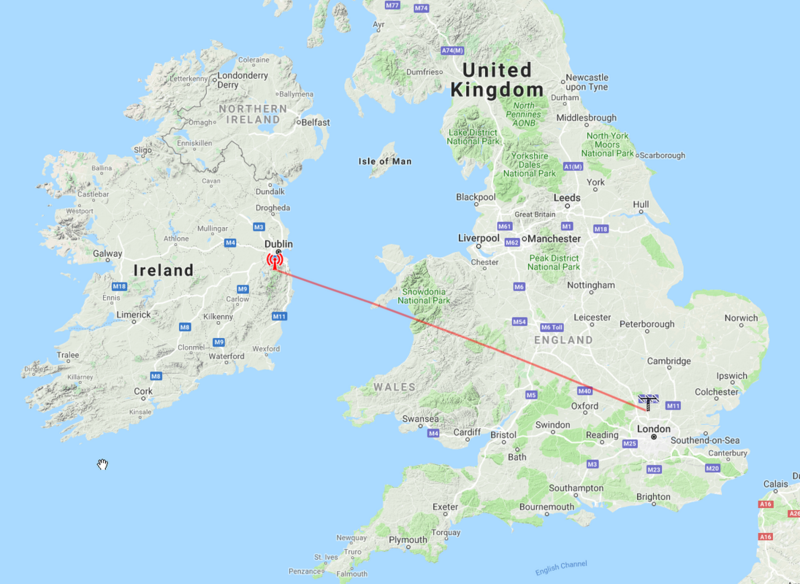 Yes, it was 98.7 RTÉ Lyric FM from Kippure in Ireland! I was receiving it on a vertically polarized FM folded dipole antenna. Ireland has been received only once in the past. It was on 31 October 2017. 98.7 RTÉ Lyric FM from Kippure is a new site for me. The TX ERP is rated at 50.0kW and the distance to the transmitter is 442 km. At 1116 UTC, I was about to finish my DX session when I scanned the band for the last time. I stopped on 99.2 Mhz. I was hearing flute music again. The signal, however, was extremely weak. I confronted the reception with RTÉ Lyric FM webstream and it appears to be the same transmission! Blimey, I thought! It was 99.2 RTÉ Lyric FM from Mount Leinster in Ireland. 99.2 RTÉ Lyric FM Mount Leinster TX site is rated at 200.00kW. The distance to the transmitter is 456 km. This was also my first time reception of this station and the location. 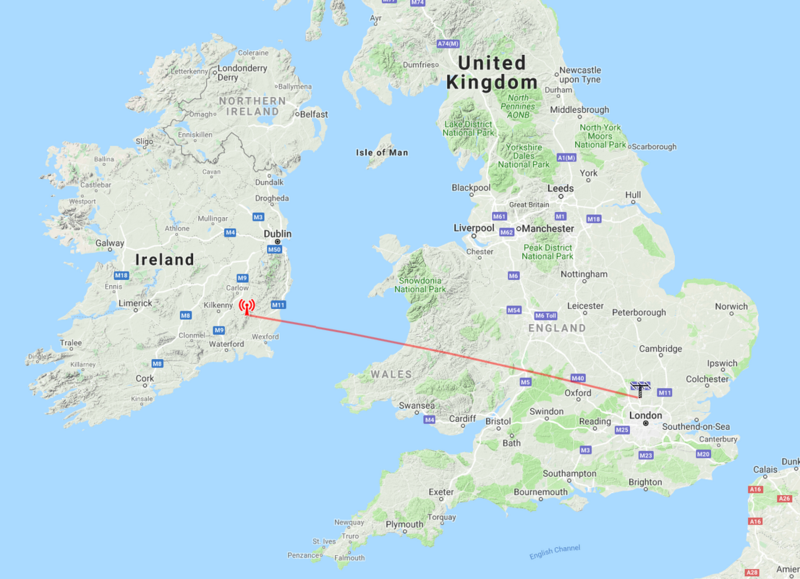 Later I checked FMLIST website for logs and appears that only Andrew Webster from Wiggan and Andy Pritchard from Telford logged Ireland that day. Bear in mind that their location is further West and they have rooftop antennas. Despite very weak Ireland signals, I am very happy with this tropo. It’s a second time when I received Ireland on FM. Below is the log as well as the highlight video from that day. All signals were received on Airspy HF+ SDR. There is one more day from April 2018 that needs write up. It will be posted in a separate entry.